Rapid Response Teams (RRTs) are a recent innovation in hospitals that makes critical care teams available to a nurse within seconds. When these teams function properly, studies have shown that they can reduce a hospital's mortality rate by almost forty percent. Yet, in spite of the possible benefits, doctors and nurses at hospitals that have committed to adopt RRTs can be reluctant to do so. 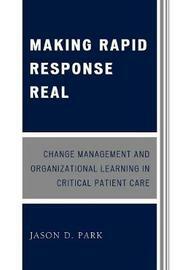 Making Rapid Response Real discusses a study that identifies several reasons why people in organizations resist this kind of change, and offers recommendations for how leaders can fuel successful adoption of an innovative practice. Applying ideas from sociology and psychology to a management context, Jason D. Park offers research-driven insights for managers in a variety of implementation situations. Jason D. Park graduated with honors from Harvard University in 2006, earning a bachelor's degree in sociology. 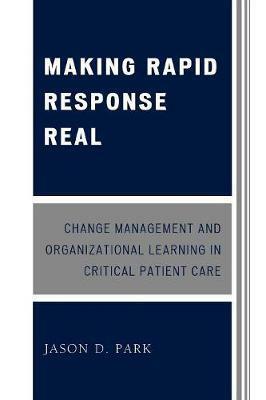 His senior thesis, Making Rapid Response Real: Change Management and Organizational Learning in Critical Patient Care, received Harvard's Albert M. Fulton Prize, which is awarded annually to the student who submits the "best thesis in the field of sociology." Jason currently resides in Chicago, Illinois, where he is pursuing an M.B.A. at the University of Chicago Booth School of Business and working in operations management for McMaster-Carr, a leading industrial distribution firm.